In our previous discussions we came across 'What are inner classes in Java' and 'What is anonymous inner class in Java'. In this particular blog we will see 'Difference between Comparator and Comparable in java ' and 'How to sort a collection or array of objects in Java'. This tutorial will walk you through how to use an 'Employee' class object as a key in Collections like hashset, hashmap etc. Before we come forward to the difference between comparator and comparable, lets us first see the implementation of these two. In java, if a class implements Comparable interface than a collection of its objects can be sorted using Collection.sort() method and an array of objects containing this class's objects as elements can be sorted using Arrays.sort(). The comparison and sorting is done on the basis of one of the property of the class in a overrriden method of Comparable called 'compareTo(Employee emp)'. Sorting an collection of java objects using Comparable. In java, if a class (Employee) implements Comparable interface than a collection of its objects can be sorted using Collection.sort() method. The comparison is done on the basis of one of the property of class (id or name), as implemented in 'compareTo(Employee emp)' overriden method. 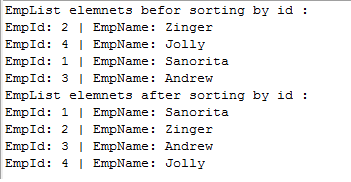 Elements of ArrayList containing Employee's objects before and after sorting by Id. Sorting an array of java class objects using Comparable. In java, if a class (Employee) implements Comparable interface than a array of its objects can be sorted using Arrays.sort() method. The comparison is done on the basis of one of the property of class (id or name), as implemented in 'compareTo(Employee emp)' overriden method. 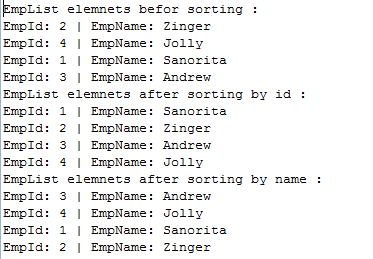 Elements of Array containing Employee's objects before and after sorting by Id. Using an java class's objects as a key in collections. Further more, Objects of classes (Employee) which implement Comparable interface in java can be used as keys in a SortedMap like TreeMap or SortedSet like TreeSet without implementing any other interface. System.out.println("HashSet value for employee1 as a key: "
Using Comparator interface, the class itself does not need to implement any interface, rather an other class implements the Comparator interface to sort the collection or array of objects using compare() method. Sorting an collection of java objects using Comparator Interface. We have created an 'Employee' class, this class does not implement any interface. To sort collection or arrays of elements of Employe we have added two new classes. 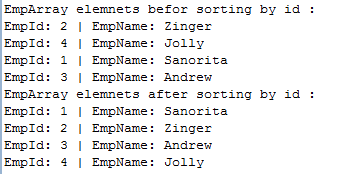 'SortEmployeeById' and 'SortEmployeeByName' are the classes implementing Comparator interface these classes can be used to sort a collection or array of 'Employee' class object on the basis of 'empId' & 'empName' respectively. 1) 'Comparable' resides in java.lang package while 'Comparator' residen in java.util package. 2) Using 'Comparable' interface, sorting logic should be written in the same class that is to be sorted while using 'Comparator' interface sorting logic is written in different class so that different sorting logic can be written on the basis of different attributes of the class. 3) Using 'Comparable' interface, sorting is done based on compareTo(Employee emp) method implementation, while in 'Comparator' interface sorting is done on the basis of compare(emp1, emp2) method. 4) Comparable's compareTo(Employee emp), compares 'this' object with 'emp' and returns an integer value. Returns 1 if (this>emp), -1 if(this<emp) and 0 if(this==emp). Comparator's compare(emp1, emp2), compares 'emp1' object with 'emp2' and returns an integer value. Returns 1 if (emp1>emp2), -1 if(emp1<emp2) and 0 if(emp1==emp2). Here we are done with Difference between Comparator and Comparable in java example and explanation. In our upcoming blogs we will see more about Java Programming and other opensource technologies.